We sighted this beauty at one of the nurseries along Jalan Sungai Buloh, Selangor in November 2013, a little over a year ago. It was love at first sight and we happily grabbed a pot of them home without hesitation. 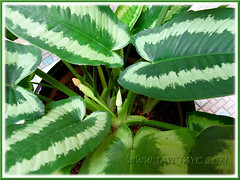 We just love variegated foliage plants and these suit perfectly amongst the crowd of potted plants at our courtyard. They were specially identified to adorn the courtyard which never takes a back seat. 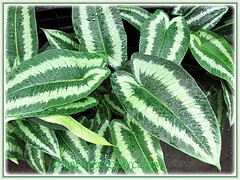 Though mostly non-flowering, these cheer-leaders with fabulous variegated foliage are plants that we would not garden without. Hence, we maintain them well so that we can enjoy them when we’re indoors and away from the blazing sun outside, especially during the hot seasons. Botanical Name: Schismatoglottis calyptrata (Roxb.) Zoll. & Moritzi (Synonyms: Schismatoglottis picta, Schismatoglottis neoguineensis, Colocasia neoguineensis, and many more). Common Name: Drop Tongue, ‘Guang xi luo yan’ (in China), Dukaruk (in Sabah – Kadazandusun language). Etymology: The genus name, Schismatoglottis is from the Greek word Schisma, schismatos (meaning ‘separating’) and glotta (meaning ‘tongue’), referring to the variously deciduous upper part of the spathe of most species. Also, it’s generally divided into a lower female flower zone and a middle male flower zone. Origin: Native to Asia-temperate: China, and Asia-tropical: Vietnam, Indonesia, Malaysia, Singapore, Papua New Guinea and Philippines. As well as Solomon Islands and Vanuatu in the Southwestern Pacific. Features:Schismatoglottis calyptrata is a charming species of the genus, Schismatoglottis that consists of about 100 species. It is the most broadly distributed species in the genus and much favoured by us gardeners. An evergreen perennial, S. calyptrata is low-growing, about 15-60 cm tall. Being stoloniferous, it spreads easily to form a colony of new plants. It is also variable in characters such as leaf colouration and shape. 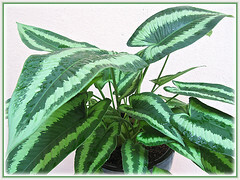 The leaf blades are generally dull mid-green, with or without variegation. The variegated ones have one to two bands along midrib or between midrib, while others are irregularly spotted/mottled grey-green to yellowish. Leaves that are held on petioles are heart-shaped, either cordate or sagittate at the base and patterned with submarginal veins. The foliar margin is simple and entire. Its erect and bullet-shaped inflorescences are rather small and inconspicuous, each consisting of a spadix and a bract called a spathe, with proximal part female and distal part male. The peduncle is shorter than the petioles. S. calyptrata are naturally found in dense tropical forests, forest understories, on rocks or at river banks. Culture (Care): Schismatoglottis calyptrata grows easily with minimum care. Moisture: Lots of water, or moderate water. Soil:Grow in well drained and moist soils. Others: Feed once monthly with a balanced foliar fertilizer. Generally free from garden pests. However, do be vigilant to check the leaves’ underside for infestation of mealy bugs or red spider mites. We were careless and encountered the following consequences as shown in the image on the right. Thank goodness they revived easily to cheer us again. For subtropical and temperate regions: Hardiness: USDA Zone 10. Winter hardy to temperatures only above at least 1°C. Propagation: By seeds or by division of clumping plants that were propagated freely by the production of stolons. The latter is an easier and quicker method… just divide them into starts for several pots or plant them straight into the garden bed. 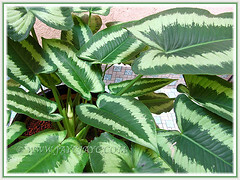 Usage: Schismatoglottis calyptrata group of exquisite leaves makes them suitable to be grown in parks and gardens. Their distinct ornamental and structural foliage make them ideal as ground covers for front of flowerbed or border under shaded or semi-shaded conditions as they’ll easily spread to beautify the area. 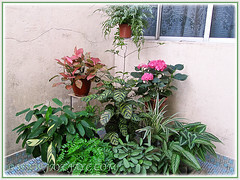 They will be most attractive in container planting and small garden. 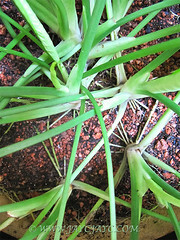 Stems and leaves of Dukaruk, another type of S. calyptrata naturally growing along the river banks of Sabah are favoured by the natives and cooked as edible vegetables. 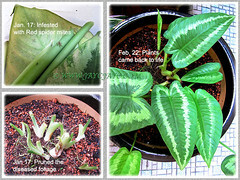 Elsewhere, the stems are used as a tonic medicine to treat lumbago and arthralgia. 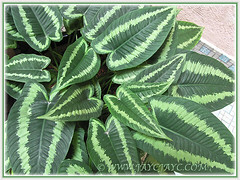 Grow Hostas for beauty, longevity and durability! 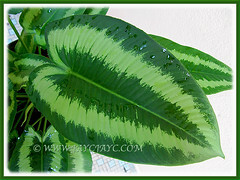 I think your plant is Schismatoglottis wallichii, which is always variegated with the “inner ring” of lighter grey-green. Schismatoglottis calyptrata is usually a solid green.